This month's main news is the birth of ATARNet. ATARNet is the name of our new discussion forum. The previous one was based on an in-built function of the Microsoft FrontPage software that I use to maintain ATARN. But the volume of traffic on the Discussion Forum continues to grow and it has become difficult to keep track of what is happening in the discussions. Include pictures with your messages up to 200KB in size. Upload files with your messages up to 200KB in size. Add URLs to your messages. Create messages with html formatting. Check for messages posted within a specified time-frame. New postings to the message board using email instead of logging onto ATARNet. Just use your email programme in the normal way and address your message to: atarnet@atarn.org ! ATARNet allows members to register and provide extensive information. However, registration is not required to post and read messages. Thanks to Bede Dwyer, Tom Duvernay and Tom Selby for helping with 'beta-testing' ATARNet. http://www.atarn.net (this address has not yet been implemented) will take you directly to the ATARNet discussion forum, by-passing the rest of ATARN. http://asianarchery.info (this address has not yet been implemented) will take you directly to the index page of www.atarn.org . Our original website address, http://www.atarn.org , will continue to function as before. For those of you who do not follow the discussion forum, I should like to repeat my request for digital video footage of Asian traditional archery in action. "In March 2002 we shall be opening a permanent museum exhibition on Asian archery here in Hong Kong. We shall have two flat-screen video displays, and on one of them we want clips of foot and horseback archery techniques from Asia. Please can you help? We prefer 3-CCD quality digital video (but well-taken domestic might be ok). Analogue video will not suit us, I'm afraid. And we need for donors either to own the copyright, or to be able to get authorization for us readily. The usage will be restricted to public display in a video loop at a single location in Hong Kong. We will acknowledge donors on the video loop. Please email me at srselby@atarn.org if you can help." The bows of India, Pakistan, Kashmir, Sikkim, Bangala Desh and Sri Lanka ('South Asia') are rapidly disappearing from their home environments. I have collected a few of them for our future museum exhibit in Hong Kong. Here are a set of photographs contrasting the construction of an 'Indo-Persian' bow from Kashmir thought to date from the early 19th Century, with a Sinhalese bow from Sri Lanka thought to date from the same time. Both bows are clearly from an aristocratic background, as can be judged from their rich decoration. This bow is 135cm measured along the belly from tip to tip. The maximum breadth of the limb is 4.5cm. It is a wood-horn-sinew bow with a thin leather covering along the working part of the limb. The leather is richly decorated in cream, black, red and gold paint, and then lacquered. The designs include geometrical patterns, peach blossom and chrysanthemums. The siyahs are made of an unidentified wood with sinew support. There are no horn inserts in the nocks. Sinew extends along the whole siyah up to one centimeter below the string nocks. The grip is strongly set-back and oval in section. There is a 1-cm sinew binding around the siyah where the longitudinal sinew coating ends. No inscription is visible. There are two original arrows. Side view of the whole bow. Back of the grip. I presume it was originally bound as the profile is very narrow. Decoration on the back of the limb. Side view of the splice, siyah and tip. Detail of decoration on the back of the limb. Detail of chrysanthemum decoration at the back of the splice. The two original arrows. Made of bamboo with shallow fletching. Arrow nocks and fletching. No inserts in the nocks. No binding on the fletching, but a layer of bark appears to have been applied below the fletching. The cresting consists of three bands with ladder pattern edges, containing four circular cartouches, each containing a black cross. The arrow points. The heads are of forged steel, filed to a square, bodkin-like point. An area behind each point has been covered in bark stained with a green copper dye, with a band of ladder pattern at each end. This bow is 178cm in length. The cross-section is round throughout. From a grip of 2.4cm in diameter the limbs taper in each direction to tips of 0.75cm diameter. 4.75cm from each tip there is a roughly-lacquered loop of hemp, which might either be the remains of a hemp string, or else an aid to tying on a separate string. The bow is made from a single piece of wood. 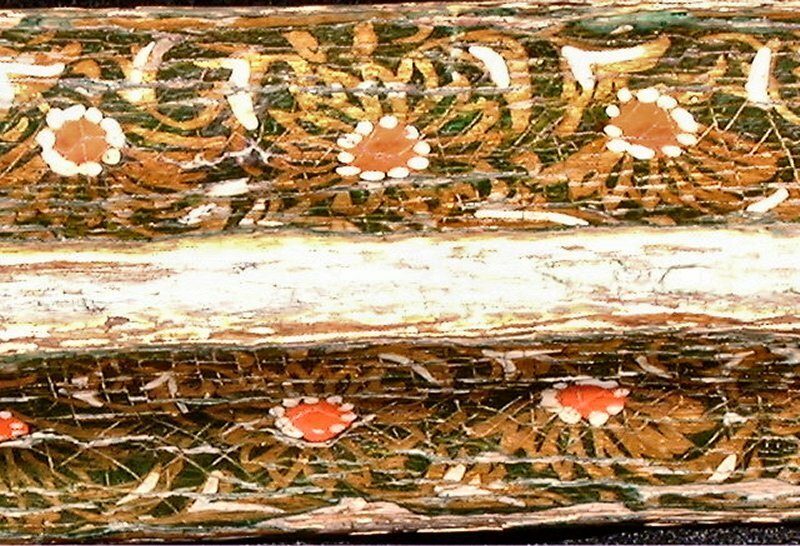 Although the wood cannot be identified, it might, by analogy with native bows commonly found in Sri Lanka, be made of palm. The whole limb is lacquered and painted in red, black and gold patterns of dots, bands and curlicues. The entire bow. The slight curvature is consistent with the original set of the bow. One of the bow-tips with a hemp loop toward the end. Detail of the curlicue decoration. Stippling, bands and 'lotus flower' decoration on the limb.